Queens NY 12/17/12 @ 09:00 hrs. Address: 95-49 Tuckerton St. at Liberty Ave.
"Batt. 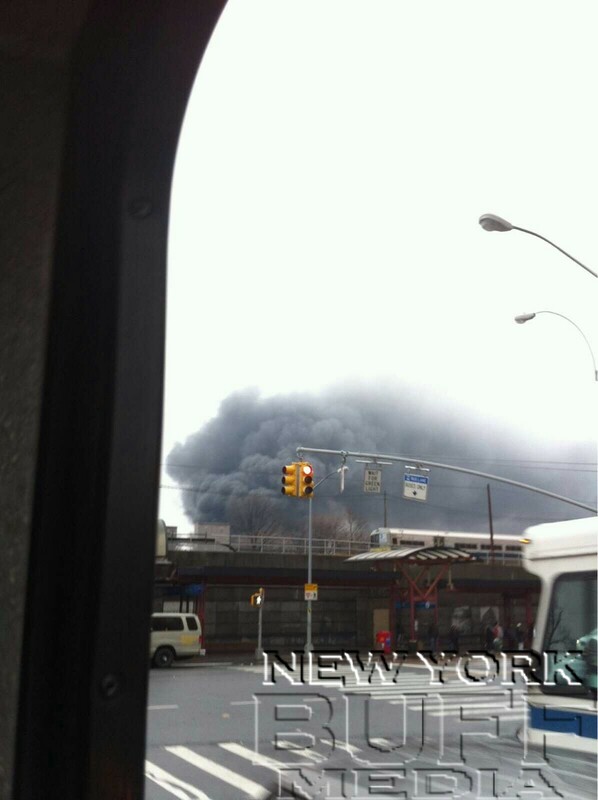 50 to Queens, We have heavy fire in a Scrap Yard. Special Call an additional Engine & TowerLadder." Batt. 53 "Resource Unit Leader"
Batt. 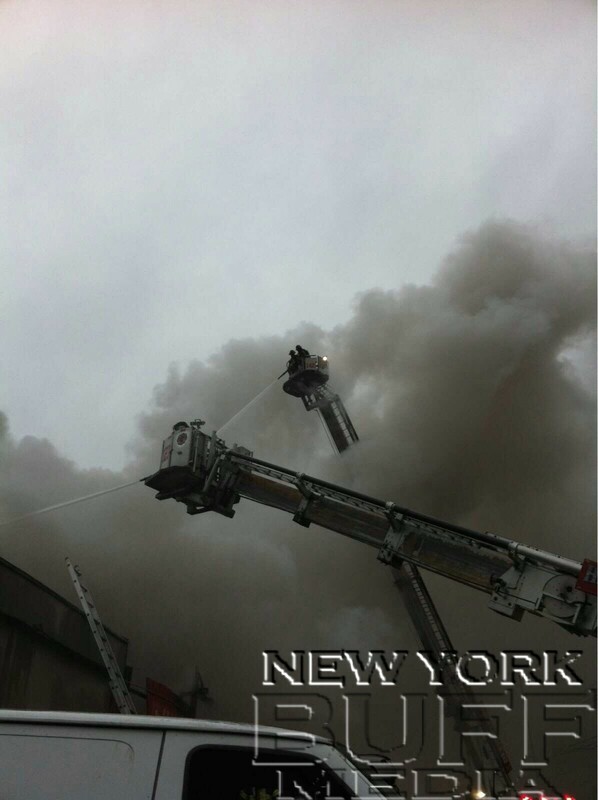 43 "Air Re – Con Chief"
Division 13: Box 8820, We have ( 2 ) TowerLadders in operation. ( 1 ) Hand-Line in operation. 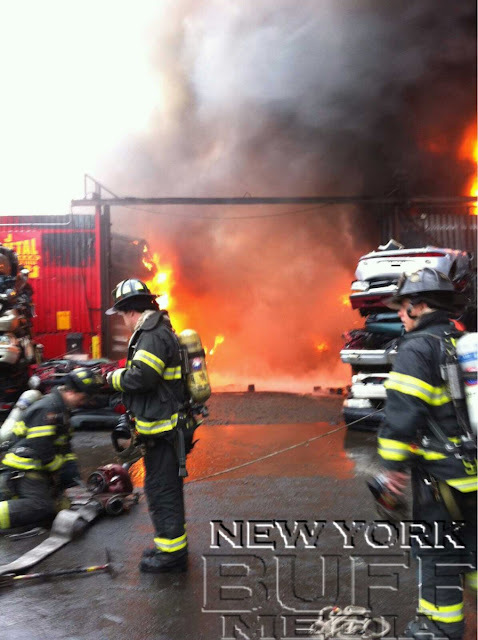 Fire in a Junk Yard. Special Call Haz. Mat. Division 13: Box 8820, We have ( 3 ) TowerLadders in operation, ( 2 ) Stangs in operation. Special Call ( 2 ) additional Ladder Co's, ( 1 ) to be a TowerLadder. Fieldcom 1: Assign an additional "FAST" Truck, report to the "Command Post"
( 4 ) TowerLadders are set-up, ( 3 ) are in operation. ( 2 ) Multi-Versals in operation. ( 2 ) Hand-Lines in operation. ( 1 ) Line stretched to the roof of Exp. #2 as a precautionary. any exposures. Fire is Doubtful. ( 4 ) TowerLadders are set-up and in operation. ( 2 ) Multi-Versals in operation. ( 2 ) Hand-Lines operating. Haz. Mat. has secured ( 3 ) 55 gal. drums of gasoline. Conditions remain unchanged at this time. Fire remains Doubtful Will Hold. Fieldcom 1: By orders of Car 8, Chief Marrone, Transmit a 4th Alarm. Have all units report to the "Command Post" at Tuckerton & Liberty Ave. Conditions remain unchanged. Still operating with ( 4 ) TowerLadders, ( 2 ) Multi-Versals. Still hitting heavy pockets of fire. Still Doubtful. Fieldcom 1: Special Call ( 2 ) Engines, ( 2 ) Trucks, and the Mobile Command Unit for "relief"
Engs. 236, 304 / Ladder 165, Ladder 50 act. 160, & Mobile Command #2 assigned. at this time. He places this Fire at Probably Will Hold. This Fire is now UnderControl. Job duration: 4 hrs. / 16 mins. 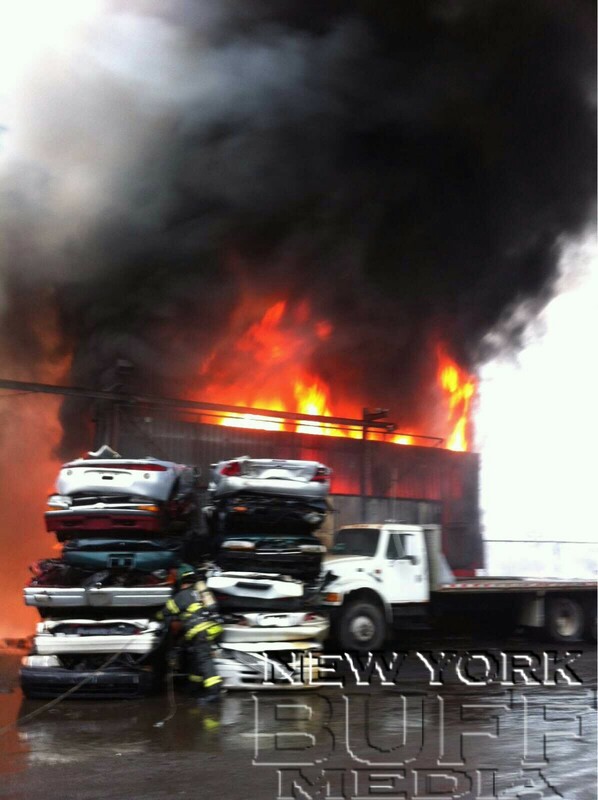 all auto salvage yards are fire hazards and never inspected for flammable chemicals and wires from outlets for tool use to cut cars and exposed to rain, causing electrical fires. An immediate city wide inspection must of all these yards needs to take action at once! Willets Point is next on a major disaster and must be examined in entirety to prevent another as this 4 alarm fire.